Hi.. I have an issue where we are using OAuth2.0 with the ZAUTHENTICATE routine. Once our token is validated we are using a users lan id (passed on the ID token) to find a software defined username in a Cache Global. That is all working fine in ZAUTHENTICATE.. I am setting the software defined username in the Properties("Comment") array and wanting to reference it in the Rest Service Dispatch class. I am finding that Properties array is not resident in the dispatch class. It is my understanding that Properties is passed to ZAUTHENTICATE by reference, but how can I invoke the dispatch class in a way that includes the array? Is there setup that needs added in the portal for web application security? Additionally I see that ZAUTHENTICATE quits with 1/0 for success/fail.. is there a way to return more specific messaging regarding the failure to the calling web application? 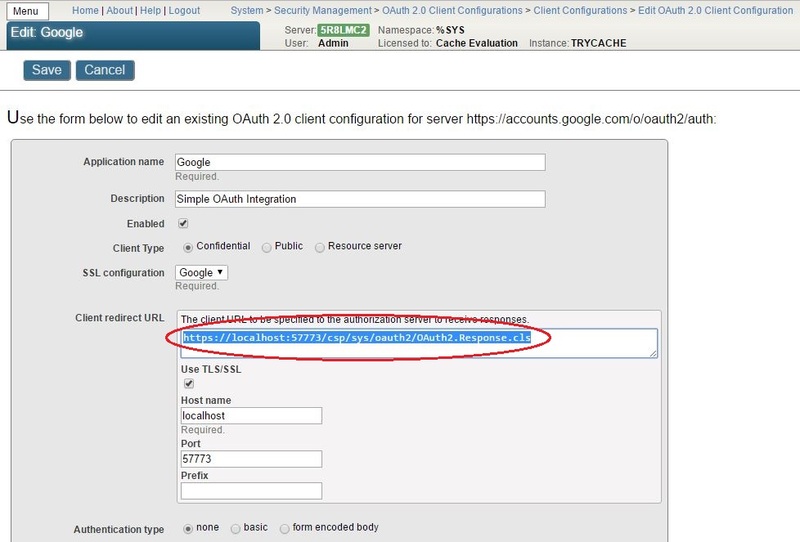 How to Change Redirect Url in OAuth2 implementation? I got authentication, But I unable to read response class. I unable to change response Class. Is there any option to define response URL manually? do you've any idea ? Is this available anywhere (for Health Connect)? I've found a few presentations but they are aimed at entry level. We're looking at supporting more and more FHIR, REST plus OAuth interfaces in future. I've built some of this into older versions of HealthShare and Ensemble but it's desirable to move to supported versions. We would be using Healthshare as a facade to other systems. InterSystems created this video as a high-level overview of OAuth 2.0 technology, geared toward developers looking to learn the basics of OAuth 2.0. It will teach you how OAuth 2.0 works, what roles are involved, what benefits it can provide, and how InterSystems Caché can be used with this technology. I am in need of a routine or class method to generate an Oauth 1.0 signature. I was about to code this myself, but thought to check first to see if anyone has already done this and is willing to share. Description: In this session we will demonstrate an application environment using OpenID Connect and OAuth 2.0. Hear how this is done and what options you have; and yes, you get to keep the code. Problem: How to use a a common login identity (e.g. Facebook credentials) and a central mechanism of authorization cross environments from multiple entities.